I hope you guys have had a great start to 2016, can’t believe that it’s the last week of January already. It’s been a hectic start to the year and I feel guilty for neglecting my blog for a whole month >.<! So I haven’t found a winter coat yet and with the temperature plummeting to about 2°C, I had to improvise with what I had in my wardrobe. One of the key things I like to do is to layer my clothes to keep warm (pretty obvious), however by adding different textures and lengths it can really change up an outfit and give you a fresh look. 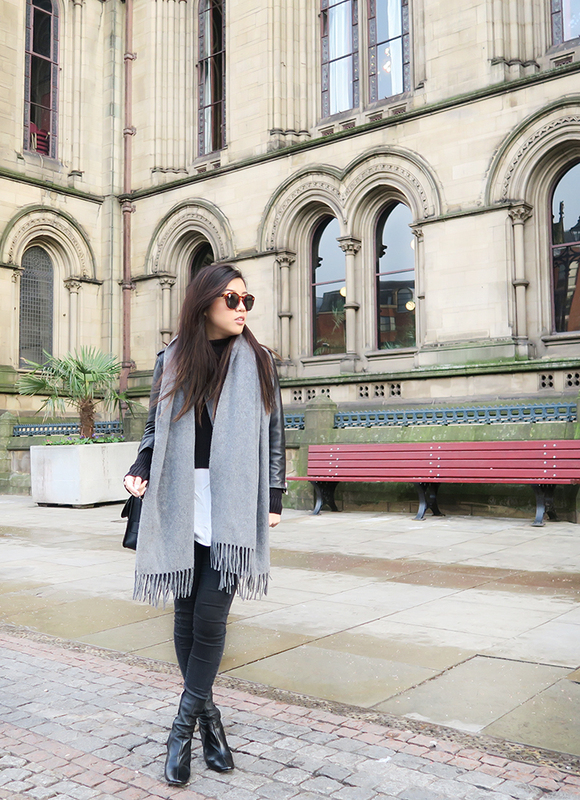 One of my favourite purchases is a thick chunky scarf, yes it truly makes a difference! I cannot leave the house without my Acne scarf, it keeps me super warm and it blocks out the harsh wind. Thank you for tuning into this weeks OOTD look! For my New Years resolution, I am going to stick to my blog and not let my laziness get the better of me, so be sure to check back and see what other styles and beauty tips I have in store for y’all! Miss your pretty face hun! You can't beat a good leather jacket and chunky knits, I have a very similar jacket from Zara 🙂 Where's you bag from hun, I love the design!